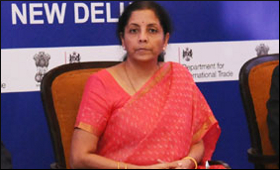 Negotiations are continuing to conclude the free trade agreement (FTA) between India and the Eurasian Economic Union (EEU), said Nirmala Sitharaman, Minister of Commerce and Industry (Independent Charge) in Chennai on Thursday. She also said as per the quick estimates, Indian exports in February 2017 stood at $24.5 billion up from $20.8 billion during the corresponding period of 2016. Addressing the media after the inauguration of the sixth edition of the International Engineering Sourcing Show (IESS), she said: "Negotiations are on to finalise the FTA between India and EEU." She said the time frame for the signing of the agreement cannot be predicted. The EEU includes Russia, Belarus, Kazakhstan, Armenia and Kyrgyzstan. Sitharaman said she had discussions with Denis Manturov, Minister of Trade and Industry, Russian Federation, on the need to finalise the revised bilateral investment treaty. She said an Indian delegation will visit Moscow in April to discuss the subject. Sitharaman said discussions were held on early operationalisation of the International North South Transport Corridor (INSTC) that would cut the time and cost for transportation of goods between India and Russia. Queried about Russia's interest in the Indian civil aviation industry, Manturov said Russia will not only supply the Sukhoi Super Jet to India but also consider manufacturing the components for the aircraft in India. Citing the aerospace cluster in Maharashtra, Manturov added that discussions will be held with the component makers there. According to him Russia is looking for Indian cooperation and would discuss with Mahindra Aerospace their participation in the project. He said Russia is ready to sign the deal for export of 16 helicopters and for manufacture of 114 units of the helicopter in India under a joint venture. According to Manturov, India could be a market for Russia's new passenger jet Il-114 as well as a manufacturing base. The ministers of both the countries said many of the MoUs are turning into actual projects. Sitharaman said Russian Railways will study the possibility of speeding up the trains between Nagpur and Secunderabad. She also invited Russia to be the 'Partner Country' for the India International Jewellery Show 2017 to be held in July 2017 in Mumbai and Advantage Healthcare India scheduled to be held in October 2017 in Delhi or Mumbai. Sitharaman said India's engineering exports are likely to reach $60 billion this fiscal on the back of revival of demand in the US and for select products like iron. During April-January of this fiscal, engineering exports have touched a figure of $50.87 billion, exceeding the total shipments of $49 billion in the entire financial year of 2015-16.